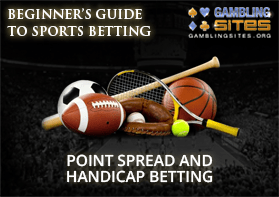 Point spread and handicap betting are one of the most popular forms of sports bets that you can place. The reason we say "one" of the most popular forms instead of "two" is that these bets are effectively the same thing. These bets are a lot of fun because they allow you to root for teams that you still think are going to lose. With point spread and handicap bets, the team you're betting on can lose the game, and you can still win your bet. In contrast, the team you are betting on can win the game, and you can still lose your bet. Now that we've thoroughly confused you let's build up your knowledge, so you're an expert on the bet type. This is like sports betting boot camp; we confuse you and break you down and then build you back up as a betting machine! Point spreads are more common in the United States, but you can see them throughout the world. A point spread, in theory, is the sportsbooks attempt to create a "level playing field." Let's look at an exaggerated example that will make this clearer. Let's say the New England Patriots are playing a game against a junior varsity high school football team. They're also using deflated footballs, and the Patriots get to see the high school team's playbook before the game. If a sportsbook were to allow you to bet on which team would win, everyone would bet on the Patriots as they would probably annihilate this other team. What the sportsbook does to fix this is they "spot" the underdog team some points to make it fair. Obviously, these points aren't included in the actual score to determine who wins or loses the game, but they are calculated in to determine who "wins" the game in the sportsbook's eyes. If you ever played basketball as a kid against an older sibling or your dad, they would sometimes "spot" you some points to make it fairer. Let's say you were playing to 20 points, they might "spot" you 10 points to make it fairer. They would then have to score 20 points to win, but you would only have to score 10. This gives you a chance actually to win the game. The concept of a point spread is very similar to this practice from your childhood. Let's look at a few actual point spreads from a sportsbook and everything will make sense. 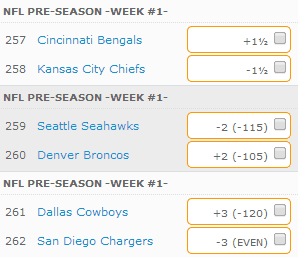 These are the point spread bets available for three preseason NFL football games. Let's start by identifying all of the elements of these bets so that you know what you're looking at. The first column is the two teams that are competing. This should be pretty straightforward. The next thing you will see is a plus or minus sign on each team's line. Teams with a minus sign in front of the number are the favorites and teams with the plus signs are the underdogs. In the above examples, the Chiefs, Seahawks, and Chargers are all the favorites. The Bengals, Broncos, and Cowboys are all underdogs. The number that comes after the plus or minus sign is how significant of a favorite or underdog the teams are, regarding points. In the first game, the Bengals are a 1.5 point underdog. This means that the sportsbook thinks the Bengals are going to lose the game by 1.5 points. This means, by default, that the Chiefs are a 1.5 point favorite. This means the sportsbook thinks the Chiefs are going to win the game by 1.5 points. As you'll see, the point spread for each team is the exact opposite. This is logical because if you think Team A is going to win by 10 points that means you think Team B is going to lose by 10 points. We bet the Chargers to win -3. In Score One, we win because the Chargers won by MORE than 3 points. In Score Two, we tie because the Chargers won by EXACTLY 3 points. In Score Three, we lose because the Chargers only won by 2 points. Score three is usually the one that confuses people. Remember, when betting on point spreads, the favorite has to win by more than the number of points they are projected to win by. The underdog can lose the game, and you can still win your bet as long as they don't lose by more points than they are spotted. In the above example, if you were to bet on the Chargers at +3, you can imagine that like you have three bonus points to play with. You can lose by one point or by two points and still win the bet. If you bet the Chargers at +3 and lose by three points, it is a tie. The last number in the chart above is how the point spread bet is paid out. We will cover that in the next section below. How are Point Spread bets paid out? Point Spread bets are paid out according to the odds that are posted. Let's look at the earlier example we were using to see some examples. We will post it again for you here, so you don't need to scroll up. In the brackets after the last two games, you will see the odds associated with each of the bets. Let's say we made our earlier example bet of the Chargers -3 and the final score of the game was Chargers 21, Cowboys 14. Looking at this, we already know that we won our bet, but just how much money are we going to get paid? For this bet, we will get paid even money because that is what is posted in the parenthesis. This means that if we bet $100, we will profit $100 for winning our bet. Let's look at a different option. We bet the Cowboys +3, and the final score is Chargers 21, Cowboys 19. Even though the Cowboys lost the game, we still win our bet because they lost by less than three points. How much are we going to get paid on this bet? Well, we look in the parenthesis and see we will get paid at -120. This means that for every $100 we bet, we will get paid $83.33 in profit. If you'd like to learn more about how to calculate what you will get paid from odds in this fashion, we have a fantastic article on moneyline bets that breaks all of this down. The point spread bets for the game in the middle between the Seahawks and the Broncos will payout in the exact same fashion. If you bet the Seahawks and they win by more than two points, you will be paid at -115. This means for every $100 you wager, you will profit $86.96. If you bet the Broncos to win and they either win, tie, or only lose by one point, you will be paid at -105. This means for every $100 you wager, you will profit $95.24. You've probably noticed by now that in the first game there are no odds posted in parenthesis to the right of each team. This means that the sportsbook is paying out both bets at the standard odds for a point spread bet of -110. Some sportsbooks will write the -110 in, and some will just leave it blank assuming that you know they will be paying out at the standard odds rate. The standard odds payout for a point spread bet is -110. This means that either side that you wager on will be paid out at -110 for a correct pick. This means that for every $100 you wager, you will profit $90.91. Sports betting is not just about being able to pick out the winner and loser of a game. Because of the various different bet types, there is a lot of different strategies that goes into how you approach them. Point spread bets are no different. One of the biggest tips we can offer is to make sure that you fully understand what you are betting on. A great pick is only great if you actually put your money behind it correctly. Thankfully, this guide should have you fully prepared for that. Point spreads and payout odds can fluctuate tremendously between different sportsbooks. A half point here or there might not sound like a lot, but it can be the key to exploiting different lines to make maximum profit. We've put together a great strategy guide for betting point spreads that should help get you on the right track. A handicap bet is pretty much the same thing as a point spread bet. The terminology is popular in the United Kingdom, Europe, and most of the rest of the world. Let's take a look at a sample handicap bet from a UK based sportsbook that offers some more options for bettors. This is four different games you can bet on, right? Wrong. These are several different handicap bets that you can make on a single game of soccer. Each of the individual rectangles is the same as the point spread bets we talked about earlier. For example, the first rectangle is betting on Liverpool at -3, getting paid 6 to 1. This means that if you take this bet you need Liverpool to win by four or more goals and you will get paid 6 to 1, or $600 for every $100 you wager. Let's say you think Liverpool is going to win the game, but you think they are only going to win by three goals. If the first bet were the only bet available, you wouldn't be able to bet on this game unless you were a maniac. 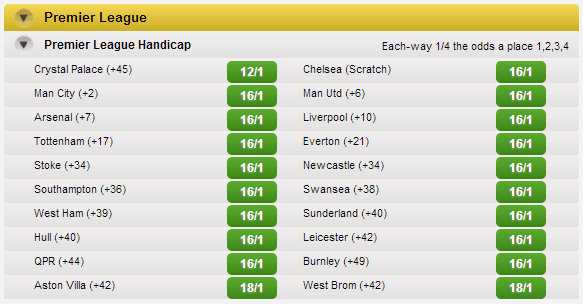 This handicap bet gives you more options, though! The next rectangle down is a similar bet except for this time it is Liverpool at -2, getting paid 13 to 5. If you take this wager, you need Liverpool to only win by three or more goals now, instead of four. If this happens, you will get paid at 13 to 5 or $260 for every $100 you wager. As you can see, this is more likely to happen, so you are going to be paid less for the bet. However, it does give you an option to bet what you want. You could even take it a step further and take the next rectangle down and bet Liverpool +1. This means that Liverpool can tie or win by any amount of goals and you win your bet. As Liverpool is a huge favorite, you won't be paid very well at all for this bet, but you can still turn a profit when you are right. You would be paid at 1 to 10 which means you would get $1 for every $10 you bet. If you bet $100, you would get a $10 profit on this bet. All of this is exactly the same for betting on Southhampton except you use the spreads and odds payouts that are underneath their team. You can also bet on the tie in a lot of sports, especially soccer. In the above example, the spread points would be added to Southhampton for calculations. This means that if you bet +3, you would need Southhampton to lose by exactly three goals. This is a tie, and you win your bet. Does this mean that Southhampton and Liverpool actually tied? Of course, it doesn't. This is merely done for the means of calculating the sports betting winners and losers. There are several different types of these bets that are offered. Let's walk you through each of them and explain the differences. Once you learn these, you will probably be more knowledgeable than most recreational sports bettors! Now you can be the one teaching people about these different types of bets. These are the handicap bets that we have already talked about. These are your straightforward bets that pay out according to the spread and odds posted. Draws are treated as a loss with this format. If you just scrolled to this section first, scroll up and read the general section about handicap bets because this type is addressed extensively with some great examples there. One of the main reasons that sports bettors like to bet is the action and excitement of winning and losing. Many sports bettors would rather take the risk of winning or losing than having the option of pushing (a tie) on their bets. For this reason, many sportsbooks offer what are called no draw handicap match bets. These are bets on an individual match that are designed so that there is never going to be a tie. In the standard handicap bet examples we used above, you saw that all of the bet options were in whole numbers. This allows for there to be draws. What no draw handicap match bets do is use half numbers so there can be no ties. Instead of a line of -2, you might see a line of -1.5 or -2.5. Since half goals are not possible in sports, this would negate the chance of a tie. Handicap league bets are quite similar to the bets we've already talked about except you are now betting on a team's performance across the entire course of the season. Bets are made at the beginning of the season before the first game is played and are not paid out until the last game of the season has been played. Here is a screenshot of some handicap league bets on Premier League soccer. As you can see, each team is listed, followed by the adjustment or line change for each team, and then the odds that you would be paid out. If you notice, Chelsea has the word scratch next to their name. This is because they are the league favorite to win and all other adjustments are made about them. If your team is in first place at the end of the regular season after the adjustments are made, you will win your bet and be paid the posted odds. As you can see, the odds pay out fairly well on these bets as they are season long and are more difficult to win. Remember with bets like this you can still be profitable by betting several options. Let's say you think Chelsea is going to win, but you also think Manchester United, Liverpool, and Everton also have a shot. If you were to place a $100 wager on all four of these teams, you would still turn a profit! Let's pretend you did this and say that your last pick Everton pulls it off and wins the regular season according to the sportsbook. Remember, they don't have actually to win, they just need to be on top after the sportsbook makes the point spread/handicap adjustments to the final rankings. Bet $100 on Everton, win $1600. So even though you lost 75% of your best here, you still profited $1200 overall! Now you can see why these bets may not seem as wild as they may initially seem. You also get to enjoy the action for an entire season on one bet. That's quite a bit of entertainment bang for your buck. The last type of handicap bet that we want to talk about is an Asian handicap bet. Don't worry, you don't have to be Asian to place this bet; it's open to everyone. This form of handicap bet is set up through the use of whole, and half number point spreads to ensure that no draws are possible. The difference between Asian handicap bets and no draw handicap bets is that the Asian handicap bets have the possibility of what is called a split handicap outcome. Your bet will have a whole number and a half number line that are treated effectively as two separate bets, but all in the same bet. These bets are less popular as of now, but most sportsbooks are starting to offer them as they are growing in popularity. The reason for the growth is that more people are starting to understand them and see that they can help you cut down some variance and risk, while still ensuring that there is no draw. The reason for the name is that these bets are growing extremely quickly in popularity in the Asian countries and betting markets. Most online sportsbooks are starting to offer these fairly regularly now. Let's take a look at a sample Asian handicap bet to make this make more sense. Some things are just better learned through getting your hands dirty. For example, imagine that you choose to bet Manchester United at (-1, -1.5). Half of your bet would be for Manchester United at -1, and a half would be at Manchester United -1.5. Let's say Manchester United wins the game by one goal. You would push on your first bet and lose on your second bet. If you bet $100 on this, you would receive $50 back for the push and lose on the other portion of your bet. Let's look at one more example just to make sure you are clear. Here are the odds for a soccer match for an Asian handicap bet. We've included the payout odds this time as well so you can experience exactly what these will look like. Let's say you decide to bet $100 on Liverpool, and they lose the game by two goals. You would push on the first half of your bet and win the second half of your bet. You would receive your $50 back for the push and $43.48 in profit on your second bet. Basically, the sportsbook would hand you back $143.48 total, which would include $50 for the push, $50 for your original bet, and $43.48 for the push. If Liverpool ends up losing the game by only one goal, you will win on both sections of the bet. You would be paid $86.96 in profit on your bet. The sportsbook would hand you back $186.96 which would include your original $100 wager and $86.96 in profit. Hopefully, by now you are an absolute expert on point spread and handicap bet types. If you're still confused on anything, take your time and reread through the examples we posted and it should slowly become clearer to you. Sometimes the math can be a bit confusing to people, so take your time. If you are ever confused with a bet, you are making online or at a casino, just ask support of the agent for help to clarify. They will be more than happy to assist you in making sure you've bet on exactly what it is that you want to bet on. Don't worry, no one will laugh at you or give you a hard time because you are confused. We all were new to this one day, and they are specifically paid to help new bettors like you understand everything and have a much better betting experience. These bets are extremely popular and a lot of fun to make. They allow you to bet on teams that you want to root for, but you know they aren't going to win the game outright. It all comes down to betting on how you think the team will perform in regards to what the sportsbook thinks. If you can find teams that you think the sportsbook is undervaluing or overvaluing, you can make a lot of money by betting on your findings.